Advantages of Orchids? There are Many! One of the advantages of orchids to you is that our suppliers provide fresh healthy orchid plants. They are mature, most between 5-8 yrs, and naturally healthy. You tell this by looking at the thick green leave as well as the root system. We do not sell orchids directly for the most part. Although I occassionally do sell off a division or a plant on eBay and I might be tempted to put them up of sale here first in the future. But I have many orchid growers who are friends And I am happy to recommend them as exccellent sources for healthy orchids. Did you know that orchids come in over 35,000 varieties and in many countless colors. They have been the symbols of love, luxury, beauty and intrigue since the ancient Greek times. Learn more about Orchid History by clicking this link. Both orchid enthusiasts and books have touted their beauty which can be admired for years, unlike many flowers. In fact, some have lasted more than a century which means gift will be admired for years instead of a few weeks. Our orchid vendors have a large selection of orchid flowers for you to chose from for that special person, special occasion or for yourself. If you don't see what you are looking for contact us now and we will do our best to find one for you. if you are new to growing orchids it is important to know that they are not particularly time consuming. That's another one of the advantages of orchids. Like any other flower or plant they will need water, light, air and occasionally some dilute fertilizer. Their care is as easy as any other house plant or flower. Oh, some soft music and talking to them help also. In the past, orchid flowers had the reputation of of being difficult to grow and care for. This cannot be further from the truth. The beauty and colors you see on the pages of this site are outstanding. Need help deciding on the right plant to buy if you are a beginner? Just let us know and we can help you figure it out. And we will try to help you quickly. Why give flowers which can last up to a few weeks? Your orchid plant can last for years. Each time your gift is seen you will be remembered. This is among the great advantages of orchids. like Cattleyas for example, are fragrant. Some so fragrant their scent will fill a greenhouse or your living room. While some fragrance defy description others will mimic common scents like raspberry, lilacs or citrus fruits. The scents attracts insects and birds for pollination continuing their propagation and life cycle. My current favorite e-book is the one I have recently completed. It is called Orchid Care for Easy Orchids Tips for Successful Care of Orchids. 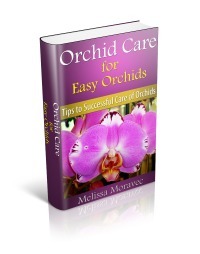 It is about 37 pages long and is filled with a lot of great information on how to grow and bloom 5 kinds of "easy to grow" orchids. If you are interested it is now available through Amazon in the Kindle Library Section. It it is $3.99 and available only available in Kindle format and only available at Amazon. Since it is listed on Kindle Direct Publishing I am not permitted to sell this book directly. Do check it out! And if you like it please do leave me a good review. I own about 20 hard orchid books and over 5 orchid e-books. I like different books for different reasons. But this is the one I would suggest to start with right now whether you are a new orchid grower or have some experience. I hope you enjoy it.